The New York Times has issued an update to its iOS apps today that now allows users to subscribe to paid content through in-app purchases. The change comes a day later than the June 30 deadline Apple imposed on subscription apps that must now provide a way for users to sign up without being redirected to a website. That means, of course, that for every new subscriber the New York Times signs up, Apple receives 30% of their in-app purchase. 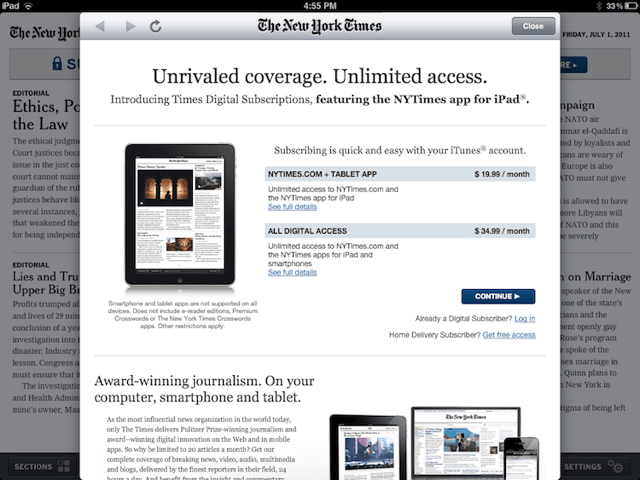 Prices start at $15 per month, and for that you get access to the New York Times website and the iPhone app. For $20 per month you can access the website and the iPad app, and for $35 per month you get access to the website and both the iPhone and iPad apps. Apple’s latest App Store guidelines, which went into force today, now demand that no application offers an external link enabling users to subscribe to content outside of Apple’s ecosystem. By implementing in-app purchases and removing any links to external subscription, it seems the New York Times is happy to adobe by this rule, whereas other apps have decided to avoid the App Store altogether.